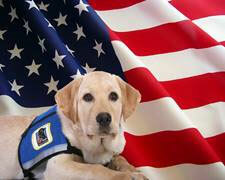 Service animals are an essential feature of American society. They assist a great number of people with disabilities. However, as service animals become more and more prominent in the modern world, there is growing confusion that surrounds them. Questions regarding where service animals are permitted, what tasks they can perform, and what a service animal even is remain as common as ever before. 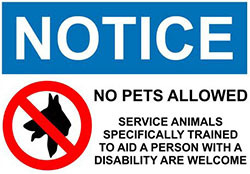 In accordance with the Americans with Disabilities Act, Service Dogs are allowed to accompany their handlers anywhere the individual with disabilities is allowed to enter. Service animals are defined as dogs that are individually trained to do work or to perform tasks for people with disabilities. As there is no central registry for service dogs, we understand that there are many attempts to pass off pet dogs as service animals. 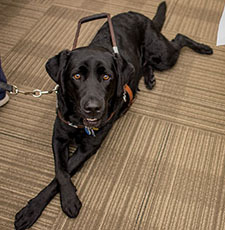 In an effort to clear up any confusion as to what is and what is not acceptable, The Governor’s Commission on Disability hasarranged a glossary of terms in order to clarify any confusion when considering a service animal. Any information provided herein, including any attachments and all associated webpages, is non-binding and for informational purposes only. Nothing herein should be construed and/ or interpreted as a legal opinion, counsel or advice. Further, there is no expertise, advice, or recommendations of any kind presented herein. It is the responsibility of the recipient(s) to verify accuracy and compliance with all local, state, and federal laws, and it is recommended that the recipient seek the advice of an attorney, and/or any other professional within the discipline which is relevant to the subject matter.